Alvise Cornaro (c.1484–1566), well born in Padua, was an energetic, religious man of formidable entrepreneurial skills. Critically ill – possibly with diabetes – around age 40, he resolved to abandon his sensual life. The healthier controlled diet led to his recovery, and later brought him to share this sober regime through his treatise, La vita sobria (1558). Its publication, with useful homilies for living to 100 years – proper lifestyle and proper personal diet – was a worldwide success, and his adoption of Galen’s “quantity and quality,” while avoiding excess in food or drink, sound prescient to today’s reader. This edition offers the most coherent, uncensored, and complete rendering of this Early Modern classic ever available in English, with Cornaro’s Aggionta (“Addition”) translated here for the first time. An introduction and essay by the late scholar Marisa Milani offer biographical analysis for his theory and a history of its English editions. Also presented are letters by Cornaro’s contemporaries commenting on the treatise, in addition to his eulogy (now viewed as having been written by Cornaro himself). 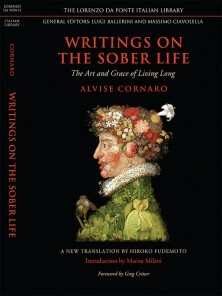 A foreword by award-winning health journalist Greg Critser speaks to the continuing relevance of Cornaro’s sixteenth-century style of self-help. Marisa Milani (1935­–1997) was an eminent scholar, most notably on the Pavano poets and language. Her earlier works on Ruzzante, posthumously collected as El pì bel favelare del mondo: Saggi ruzzantiani, led to her 1983 critical edition on Alvise Cornaro.